Entrepreneur in the history books: Madam CJ Walker. How does Madam C.J. Walker come up in a conversation about Shea Moisture? In the new millennium entrepreneurship has become a hot commodity. In April of 2017, the CEO of Shea Moisture was under fire for a ad that placed a caucasian woman amongst ethnic women his brand was normally known for. The funny thing after researching Dennis is, he owns a collective of brands including Madam C.J. Walker brands. Madam C.J. Walker is known as the first female millionaire in America. Her WHY for doing this had to do with losing some of her hair. 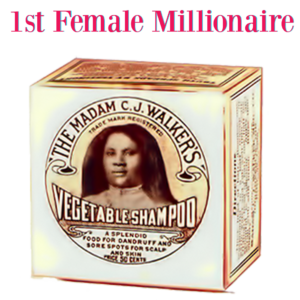 She created products for the African American woman. The products included creams for your hair, lotion and etc. She would travel all across the country promoting her brand and the lifestyle for African American women. The future of the health and beauty is wide open. This is currently a billion dollar industry here in the states, not to mention what is happening around the world. I would research more about Madam CJ Walker as an entrepreneur.